Supported by Zoe & The Guys also Special Guest to be announced soon! Holly Ellison comes to Gosforth! 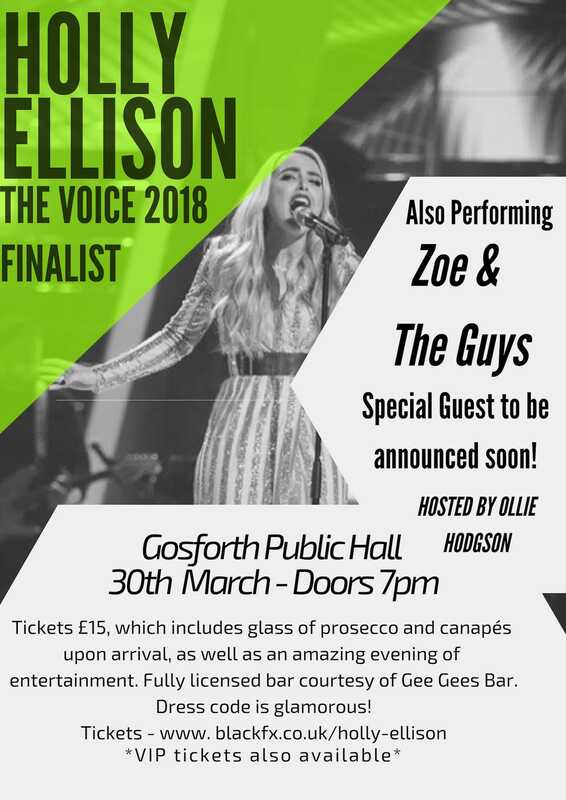 As seen on ITV’s The Voice 2018 Holly Ellison is an upbeat and energetic singer/ songwriter & actress from Liverpool. Standard tickets include glass of Prosecco upon arrival and an amazing evening of entertainment with canapés! Fully licensed bar from ‘Gee Gees Bar‘. Limited amount of VIP tickets available! This include: A bottle of Prosecco and a chance for a photo opportunity with Holly Ellison and the supporting band! Photos will be taken by a professional photographer – watermarked photos will be available online with the chance to purchase printed copies. Copyright © 2019 Black FX.